Well we decide that despite the gloomy weather we are going to try to film some bear today. Clarence is there to take us out to our blind with the speeder. He helps us situate it so that it doesn�t interfere with the train when it comes through. The rest of the crew pick him up to head back to the cabin and riverboat to work for the day. 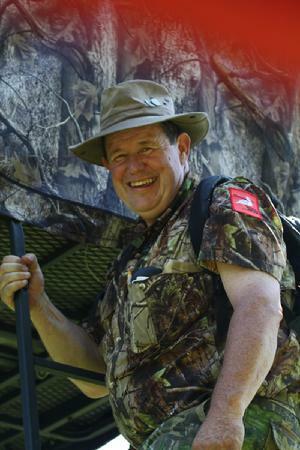 As we get back to the blind we spot one bear but it disappears into the brush as only a bear can do. The sun is trying to break through. Yeah!! There are a pair of Sandhills on the tracks and another pair flying. We can make out another bear at the first station. along with some ravens and even a bunny. We spot a younger bear near the middle station. Sweet! We have a young coyote milling around. It weaves in and out of the area to the south of us. I am on the north side of the blind checking for any movement. Oh my gosh! 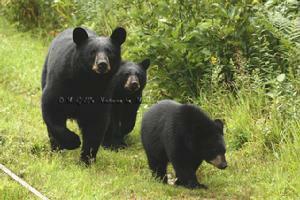 There is Goofette with her two young cubs, Ole and Lena, scampering after her as she heads to the third station. And here comes the first train at 11:00am. As the train rounds the bend to the south they are lucky enough to have a bear in front of them that moves off to the side. But they are even luckier because Goofette and her cubs come running toward the train then quickly verse off but not before they could all get a look at mommy and the babies. One little boy�s expression was worth a thousand words. The family made their way to the second station-nothing there. Then they headed to the first station where another bigger bear, we think its Bonnie, was enjoying the treats that had been left. Because of the amount of people on the first run, Randy had to take some of the cars back to do the midday train only run. Goofette and her kids barely got off the tracks for him to get by. Then they continued further south where Bonnie took up residence again laying next to the food. Then a deer poked its head out to see if the coast was clear but decided to head to the east. While we were watching bear I noticed a spruce grouse and three chicks make their way across the tracks to the north of us. Michael also spotted a pine martin later in the day. When the noon train came through they were greeted by big Bonnie and a second or third year bear. Dixie dropped them off a treat. The people all satisfied with the presence of the two bear. After the train went through Bonnie decided to come investigate the other stations to see if there was anymore goodies for her. No wonder she is so big. 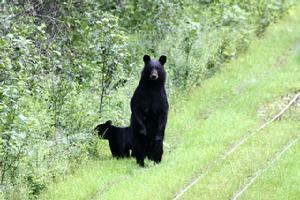 As she head north toward the blind Goofette and her cubs popped back out to the south of us. You think they have disappeared when�they suddenly pop out of the brush. At some point the momma bear with three big cubs came out on the tracks to the south of us. We take a quick potty break. No sooner had we got back up to the blind then Goofette and the cubs come back out. As Randy comes back into the cabin with the empty train nothing is stirring except for rain. I take a quick snooze as Michael keeps his eyes peeled for any action. Dixie heads out with the last train of the day. Just before they went through Goofette and her young were out around the second station but, of course, quickly popped back into the brush. 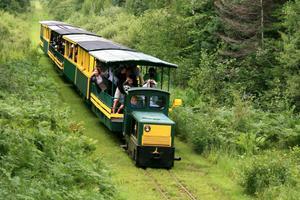 Dixie radioed us to head out as soon as the train went through so we wouldn�t collide with the crew on their speeder. So we got everything down from the blind and on the track. We then got the speeder back up on the tracks and headed out. Wouldn�t you know that that was when Goofette and the cubs decide to come back out on the tracks. But we thought we needed to get moving so we didn�t take time to slow down and shoot the family. Maybe we will get lucky again the next time we come. <?xml:namespace prefix = o ns = "urn:schemas-microsoft-com:office:office" /> t is a gorgeous day!! The sun is shining and the heat building as we take the speeder and head out to our blind. Bonnie and the 2 or 3 year old were waiting for us as we approached station #1. After we got settled the crew was heading back to the riverboat. 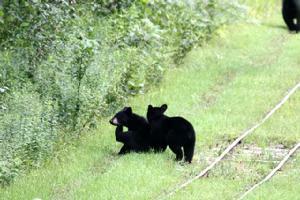 While they were dropping off some things at station #2, Goofette and her two cubs, Ole and Lena, were there. 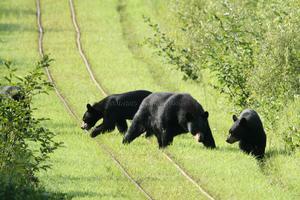 After the crew left we noticed to the north of us the momma bear with three yearling cubs. They got just passed the speeder and momma didn�t like what she was smelling-us! The cubs investigate a little closer and then spun around and headed into the woods where momma had gone. We were able to get some great shots of the cute little buggers! It is just 9:30 and we have already counted nine bear. It is definitely a great day! Our momma and three cubs came back out at station #2. They sniffed our peanut butter sandwiches we had left for them. The cubs really enjoyed those. They came right up near the blind to make sure they didn�t miss any. Of course, once again we got some great shots. 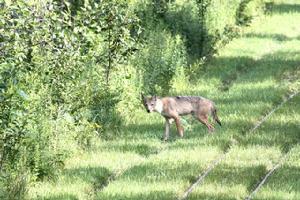 But once again they didn�t pass by us they went into the woods behind us and came back out at station #3. It is now 10:00. All of a sudden it looked like a parade of bears. Goffette, Ole, Lena and Bonnie were heading up to station #2 but then decided to go back to station #1. I am sure they wanted to be the first to greet the morning train. LOL! Michael called Dixie to give her the bear update. She said they had to make the extra trips again today with the engine because they had over a hundred people going on the tour! Unfortunately, some of the train cars are waiting for repair to the wheels so they have to use some of the same cars for the midday run, too. But that means business is good. Yeah! The first train came through at 10:50. 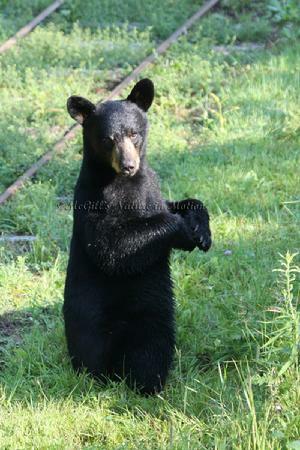 They were greeted by Goofette and her cubs along with big Bonnie. After the train went through we were entertained by ravens, seagulls and a couple of turkey vultures who were after something left at station #3. They were raising quite a ruckus. The empty train headed back to the depot around 11:40 to be ready for the 12:30 train trip. One of the three cubs came out of the bushes to station #3 then another one appeared . They disappeared as quickly as they appeared. That is what is really amazing-how such a large mammal can so quietly be swallowed up by the foliage. Around noon the babies, Ole and Lena, appeared at station #1. A grouse is clucking to its chicks and a Pileated woodpecker is jabbering as it flies behind us. The grouse appears on the tracks as she waits patiently for all NINE of her chicks to get safely to the other side. We have a beautiful breeze blowing through the blind. Being twelve feet off the ground has its advantages. Goofette is back out waiting with her cubs for the train to come through at 12:55. A mature eagle is soaring overhead. It is a wondrous sight to see. The majesty of that creature never ceases to amaze me. It gets quiet as the afternoon starts to heat up. We are sure all the little creatures(and big ones, too) are lying low for now. We do spot a ruffed grouse with one large chick crossing the tracks to the south of us shortly before the train tour heads back to the Soo Junction. We decide to leave as soon as Randy goes back to the river to get the riverboat passengers. Shortly before he comes through we spot a goshawk swoop across the tracks in pursuit of its prey. A couple of deer appear to the south of us. 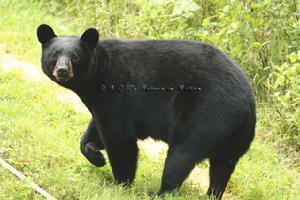 Then to our surprise we have a bear to the north of us at station #3 along with a pair of Sandhills. We think it is the young bear. 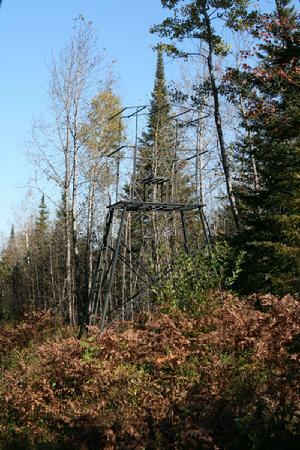 Yep, its sneaks behind us through the woods to check out station #2. By the time Randy comes through everything had vanished. But�when we had the speeder back on the tracks ready to head out, Goofette and her cubs showed up at station #. Unfortunately they disappeared as we went by and did not come back out to say �good-bye�. We had a great day despite the heat and can�t wait till next weekend. We are taking the riverboat ride with friends from Seney National Wildlife Refuge, Pat Foldenauer, a volunteer at the Visitors Center and Maco Sanchez, an intern at the Refuge for the summer. Neither of them have been and would love to see black bear in the wilderness. Sweet!! It is overcast with a little mist falling. Pat Foldenaur, a volunteer from the Visitors Center at Seney National Wilflife Refuge and Marco Sanchez, an intern at the Refuge, meet us at the trailer to head out to the Toonerville Trolley & Tahquamenon Falls Riverboat Ride. Dixie is busy as usual making sure everyone gets their tickets and appropriate information in regards to what they will see and do on the trip. Renee is making sure everyone get coffee, donuts and bug spray. LOL! We take our place on the train and visit with the other passengers on board. People from all over the country. A gentleman from Chicago who has taken the trip numerous times and always enjoys it. 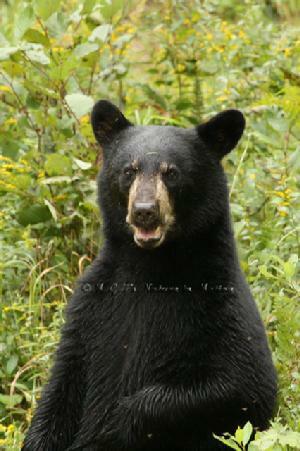 As we get closer to where our blind is located we spot a bear ahead of us but� it disappears. We are always amazed at how such a big creature can evaporate in seconds. There is still plenty of corn at the second station but� no bear. We see a few Sandhill Cranes though. I do love these special creatures and their unique cackling. We are meet at the riverboat by Captain Kris and his crew. Captain Kris lets us know that an osprey was perched in a maple up ahead of us. Well, we got entertained for sometime with the osprey trying to stay ahead of the riverboat. The osprey finally turned and headed back. We quickly found out why. 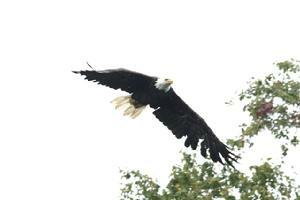 A beautiful mature male bald eagle came soaring over the top of the trees. I was able to get a couple of good shots before it disappeared. The sun didn�t shine but it was still a lovely day on the river. Kingfishers kept us entertained throughout the day along with spotted sandpipers(teeter totters). We had a momma whitetail deer and her two fawn getting a drink along the riverbank. A family of black ducks, teal wings, a Sandhill crane and ,surprisingly, a common loon. We hiked back to the Upper Falls. Michael and Marco went down the 150 steps plus to view the Falls from the base while Pat and I went down the steps to view the top of the Falls. One the trip back we had a great blue heron do like the osprey. It tried to keep ahead of the riverboat. I was able to get some good shots of it before it turned and headed into a little cove away from the traffic. When we got back to the dock we were all greeted by a momma white-tailed deer and her two fawn. 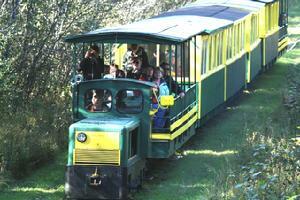 On the train ride back to the depot we did have one bear ahead of us on the track but it disappeared into the bush. We did have several Sandhills on the tracks and a goshawk took a quick swoop through before we end the ride back to Soo Junction. All in all we had a very enjoyable trip. Pat and Marco were impressed with the wealth of knowledge that Captain Kris shared with us along the way. Soo Junction Journal August 16, 2010It is a partly cloudy day at 60 degrees with strong west/northwest winds. We say �Hi� to Dixie as she busily prepares for another riverboat excursion. Clarence agrees to take us out on the speeder in order for Michael to get some work done on the blind. He also wants to do a little tree and brush trimming before we settle in for the day. 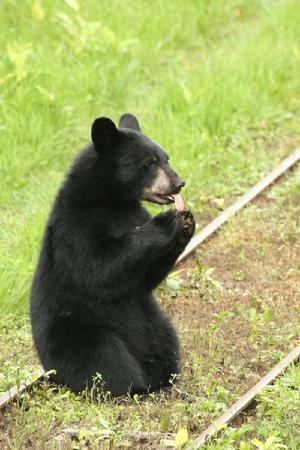 Clarence puts out the corn we brought for the bear. We also brought them some other goodies. As we go by the second station Goofette steps out with her two cubs Ole and Lena. Since we didn�t stop and give her any treats she retreats back into the wood awaiting the next speeder delivery. 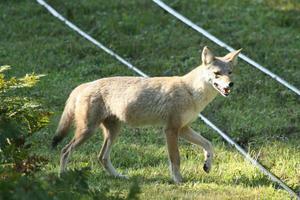 While Michael and Clarence are spreading feed a young coyote steps out between station #2 and our blind. The crew stops to pick up Clarence to head back to the Mill. Beulah and her three yearlings are at station #3 eating and lounging. 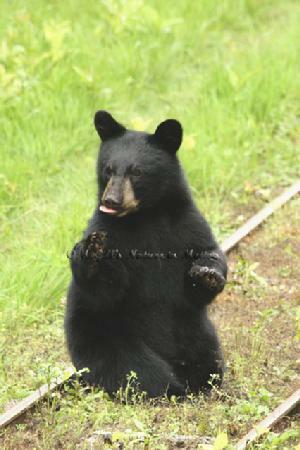 The two year old bear is wandering around down by station #1. We watch as the coyote has a run in with one of Goofette�s cubs. She took after it. She eventually runs it off but not till it got its fair share of the bounty. What is so fascinating is that the ravens have no fear of the bear. That is what we have found when photographing eagles in our blind near our home. Ravens are very clever creatures with a lot of moxie. So we waited and waited and waited. Finally just before noon we see our little mother. She peeks her head out then steps back in. She repeats this process until finally she feels comfortable enough to venture toward our blind. Yeah!!!! She weaves from one side of the trail to the other smelling as she goes. She remains cautious even while they are all feeding on our treats. 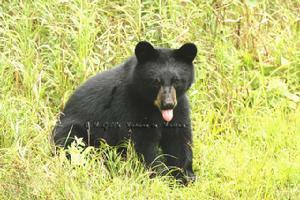 She was very leery as one of the cubs, we think is a male, named Ole wanders pass our blind. Mommy apprehensively follows Ole past the blind grunting as she goes. Little Lena follows at a safe distance. When mommy got too close to the treats that Ole was enjoying he growled at her. Mommy decided to check out the speeder to make sure it wasn�t going to attack them. Then big brother, Ole, had to take a snoop at it too. Little Lena got something stuff in her mouth that made her make a lot of cute faces for us. All in all it was a very good day at the Toonerville Trolley. Before we left to follow the Wilderness ride back to the depot, Big Bonnie came out to station #1. She was there before the train headed back and remained there after we went, too. Hopefully, she will hang around for the last train of the day. 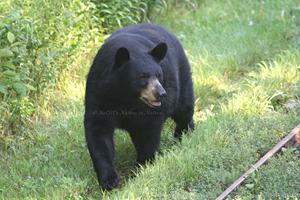 Correction- it was a large male bear at the station. Dixie had also seen it in the marsh on the noon run. Not sure where he came from?! We enjoy the time we have to be able to photograph and study these intriguing mammals. We are truly indebted to Dixie and Kris for allowing us the privilege of using their land, equipment and time in order to make this possible. It is especially nice today since this is Michael� birthday!! Thank you!! 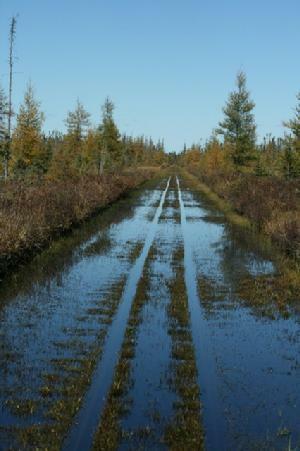 Sun was shining in Seney when we left this morning at 7:30 am but the closer we got to Soo Junction the gloomier it got. We got to the depot by 8:15 am Clarence helped Michael get the speeder ready to go while I took Dixie the new bear photos and jump drive. 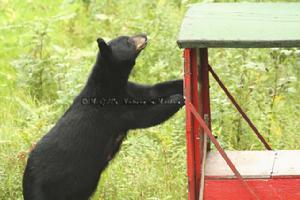 When we got to our blind we didn�t have any visitors(bears) but we did have two Sandhills. The crew came through around 9:30. A few minutes later the two and � year old popped its head out of station #2. The coyote was in and out of the area didn�t seem to be able to decide what it wanted to do. Ten minutes later we discovered Beulah and her triplets were down at station #3 laying down and enjoying their treats. 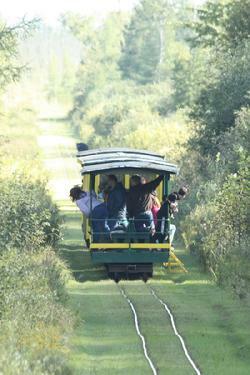 When we looked back down at station #2 our 2 � year old headed across the tracks and into the woods. Shortly after that a huge bear stuck its head out of station #2. Wow!! Its bell was so big it was practically dragging on the ground. Ravens and crows are carrying on all around us. Blue jays are squawking and the corn. The coyote is still milling around. 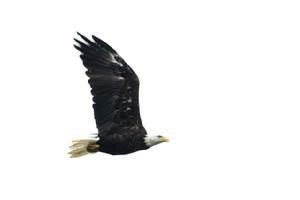 Sweet, a bald eagle just flew over us heading south. Finally, at 10:30 Beulah and the kids made their way down toward us but�they ducked into the woods before they got to us. Bummer! Before we knew it one cub then the others came out of Spring Camp drive. Beulah finally relented and came out too. They all enjoyed the eats. 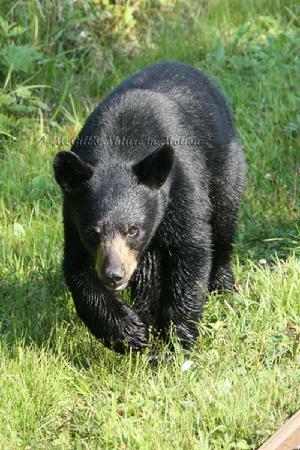 The one cub wanted desperately to go passed us to the other eats but didn�t quite have the nerve. Beulah decided it was time to head down to #1 but the kids weren�t ready to leave yet. Mom went just so far and then sat down to wait patiently for her young. While she was waiting a white-tail doe came out of the logging trail across from #2. 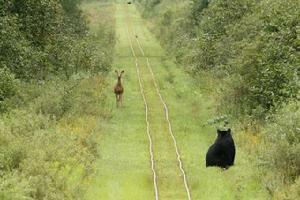 The two had a little standoff but eventually the doe headed into the woods while Beulah continued to wait. Two of her cubs eventually caught up with her just before the train rounded the corner. 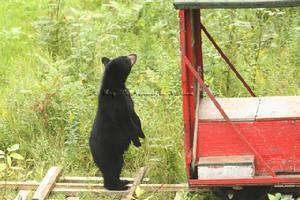 The one curious cub finally got up the nerve to go by the blind to see what was on the other side. Sweet!! It was so caught up in investigating, didn�t realize that the others had left him. By the time he did notice the train was coming and was between him and his family. It was cool to watch and film. The people, at least, on the front of the train got to see the little bugger as he went from one side of the tracks to the other. Beulah and all of her cubs were together again at station #2. We thought they would come back toward us because Dixie and Randy had tossed out some treats on both sides of the tracks but�no such luck. They went east into the woods where we figured they would come back around behind us to #3 but�no such luck. Around 11:30 the Big Bear slipped out on to the trail just passed #2 but disappeared into the woods. A pair of Sandhills came flying down he tracks right toward us. They stopped at #2 then slowly fed as they went to #1. We had two hawks soaring overhead. One looked like a red-tailed hawk not sure of the other have to look it up. The young red-tailed hawk came in on a dead tree by Spring Camp drive. I was able to get a couple of shots off before it flew away. Sweet! The Big Bear is back out on the tracks by station #1 around 12:45. Well, we had hoped it would have down near us but�no such luck. We decided to wait until the train returned to the depot before we head back out. We are glad we did. Around 3:00 we had what we think was one of the triplets pop out of the woods (in a very random area). It entertained us for over 20 minutes. It was afraid of the speeder then decided it was ok. It popped back into the woods then came out from behind us to the south. It finally walked right beneath the blind to get back to the north to eat some treats. All of a sudden it disappeared and never came back out. Strange! That was pretty much it for the day. But it was a good day despite the weather. We headed out for Soo Junction by 7:15am with temps in the 70�s and heavy ground fog. We made it Soo Juntion by shortly after 8:00am. We gave <?xml:namespace prefix = st1 ns = "urn:schemas-microsoft-com:office:smarttags" />Dixie the new photos from last week and headed out to load up the speeder. Clarence helped us fire it up and off we headed out to our blind. Luckily there was a breeze as the heat started to build. We got settled in just before the crew came through to start their work day. A couple of Sandhill cranes arrived at station #3 but didn�t stay long. It wasn�t even fifteen minutes before our coyote showed up. It spent most of its time at #2 station, taking food from the one side of the tracks to the other side. We figured it was covering all bets incase the bears came in for the fair share. The ravens pestered the heck out of the coyote but it stayed diligent. The grackles flocked to the corn along with blue jays and chipmunks. We had a bunny rabbit pop out a couple of times, but luckily that was after the coyote had disappeared. The temperature rose into the 80�s as we patiently waited�and waited� and waited. A rough-legged hawk landed in a tree nearby but not able to film it. This means that migration has started. Rough-legs live in the arctic tundra during the summer and head down to easier pickings in the winter. 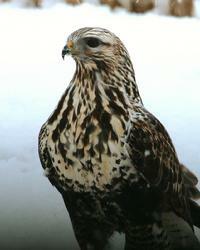 They are a very beautiful predatory bird. I am adding a photo of one that we filmed last winter from our �eagle� blind. The coyote reappeared as it headed down toward us. It popped back into the bush only to reappear out of the logging trail near us. Then it quickly crossed over to Spring Camp and disappeared for good. 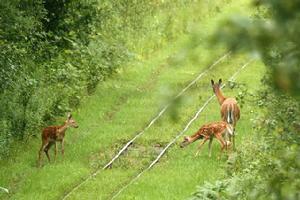 Just before the train came through, a doe and her fawn came out to station #3. Once the train got close, they, too, disappeared. Looks like a good load headed out to enjoy the Tahquamenon Falls Riverboat Ride. Hopefully, they have a better breeze that what we were having. We know the crew will be the ones to suffer, having to cook over the grill. Well we decide if we didn�t see anything else by noon, we were calling it quits. So when noon came we headed out. 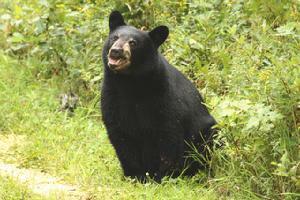 We hate to but common sense says the bears won�t come out till toward evening if even then. 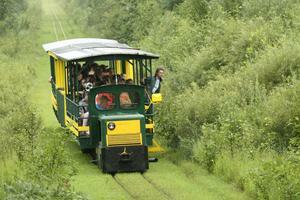 We didn�t head in till after the 12:30 Wilderness Train Run. We were able to visit a little with <?xml:namespace prefix = st1 ns = "urn:schemas-microsoft-com:office:smarttags" />Dixie before we headed out. No sign of anything as we got to the blind. A few ravens and a turkey vulture were flying around. Some Sandhills came in around 1:30. Shortly after the train came back through we had a mature bald eagle soaring overhead. 2:45pm and we have eight ravens & two sandhills at #3 and ravens at #1. 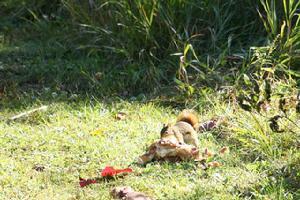 A couple of red squirrels were messing around. We even had a young red-tailed hawk perch on a dead tree to look for some easy eats. Finally at 4:30 a bear stepped out on to the tracks near #1 station. It must definitely be �bearzilla�. It is HUGE!!! After finding nothing of interest at #1 he started to slowly make his way down to #2. His belly is so big it appears to almost touch the ground as he walks. Shoot! Here comes the last train from the riverboat ride. 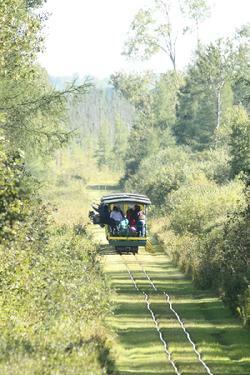 We yell to the people to look for the big bear further down the tracks. Everyone started leaning out to see if they could catch a glimpse. We were hoping someone was able to get a good shot of him. He just sat down near the track and waited for them to go by. He then disappeared into the brush. We never did get to see him up close but we always hope for another day. 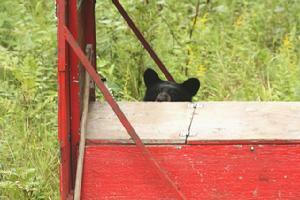 Well, we didn�t get out to our bear blind last Monday. Weather was iffy and poor Captain Kris broke his ankle. The crew had to go back to help him get out to go to the doctor�s office. So we decided headed over to Whitefish Point and then checked out the Sandhills in Rudyard(over five hundred). We decide to wait till the afternoon to head out to the blind. The bear are getting lazier as Fall approaches. Dixie informed us that a lot of the track in the swamp is under water. So�it is slow and easy. As we get to the station #1 it has been hit but not #2. So maybe we will get something in. There are five Sandhills at station #3. The ravens carry on as usual. A few songbirds tweeting with a chattering of a red squirrel every not and then. It is mostly sunny but very windy coming out of the northwest. Bear do not like the wind so who knows what will happen if anything. So we wait�and wait�and wait�but the only thing that came near our bait was an industrious red squirrel who happens to love Johann�s pastries. It would get a big hunk and take off to stash it. It would come back, eat a little then off again. It entertained us for an hour or so then�waiting. Finally we decide when the train came back through that we would head out right after it. We didn�t want to cause any extra worry for Dixie and Kris. Dixie is having to spend every night back at the cabin to haul water and firewood since Kris is unable to. She is one tough lady. It is not as if she doesn�t have enough to do with running the business and taking care of everything at the house. So we definitely didn�t wanted to add any more stress. So we headed out without seeing any bear, again. But there is always a next time and maybe even a moose or a wolf will cross our paths. After a run through the Seney National Wildlife Refuge we headed to Soo Junction. It was sadly time to take down the camouflaged canopy from our �bear� blind. 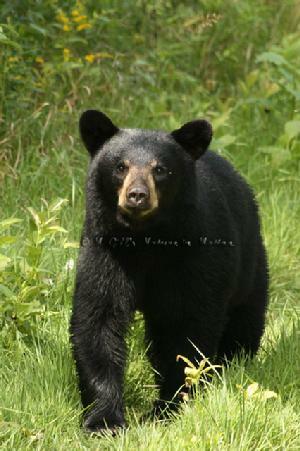 As Winter is approaching the black bear are getting lazier, slowing down and fatting up for their long hibernation. 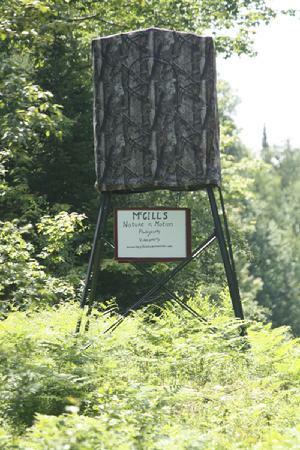 We had hoped to keep our blind another couple of weeks in hopes of capturing a moose or wolf on film. It is the �rutting� season for moose so the bulls are out in search of a female. They will typically use the waterways as their �highway�. 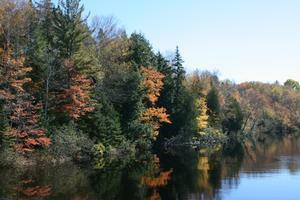 Maybe we will catch sight of one on the Tahquamenon Falls Riverboat ride tomorrow. Well, it is a spectacular morning. The frost is on the pumpkin as they say. But it is warming in the Fall sunshine. 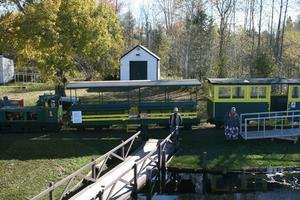 We get to the Depot at Soo Junction around 9:45am. Quite a few customers are already there eagerly awaiting departure. As we start our journey on the Toonerville Trolley train we splash through a considerable amount of water still on the tracks from the last couple weeks heavy rains. This is the first trip out since September 28. Not only have the tracks been under water but the boat dock has been submerged. Captain Kris and his crew have had to weight the dock down in order to keep it from floating away or damaging the boat. On our trip back to the boat via the train we spot a mature Bald Eagle sitting majestically on top of a huge pine tree. We also spook a white-tailed deer. We only could take a partial riverboat ride. 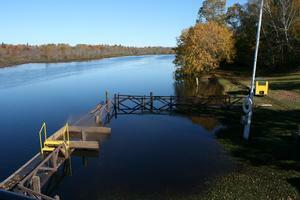 We could not go to the Falls dock because it is still 6 inches under water. Also the crew hasn�t been able to check out the trails to the Falls for fallen tree etc. Always glad that we �over dress� for the ride because no matter how beautiful it is out, it is still a cool damp ride on the river. Unfortunately, a lot of the Fall colors have been lost. Large winds and the rain have taken down a lot of the leaves. But it still was a beautiful serene journey. There is less traffic on the river and at the cabins, so it is easier to picture what it would have been like a hundred years ago. Captain Kris said that a lot of duck hunters, deer hunters and bear hunters have been tromping around in the area so we did not see much wildlife on this trip. 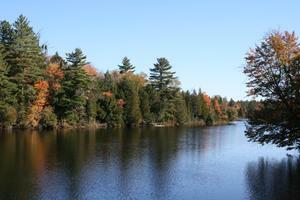 We were also hoping to catch a glimpse of a moose on the river. It is �rutting� season so the bulls are out searching using the waterways..
Maybe we will catch one on the last Riverboat run of the season on Saturday, October 9, 2010. If not, we always have next year to look forward to.